The ISlide Mantra NBA Slides feature customized Golden State Warriors graphics on upper adjustable straps. Printed 'The Town' graphics on the upper straps pay respect to the culture and legacy of Oakland, CA while boosting team spirit. ISlide midsoles utilize RPL Technology on the footbed for a comfortable, cushioned fit. These one-of-a-kind NBA Team Slides by ISlide are a true summer essential; perfect for wearing around the house and rugged enough for outdoor use. ISlide NBA Slides are individually made per order. No returns will be accepted for sizing. 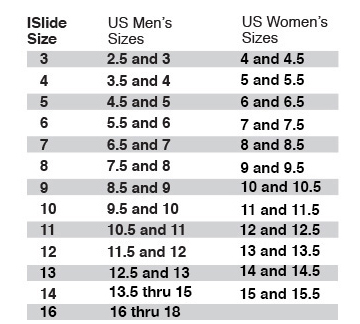 Please check the sizing chart below.